The DCC welcomes members of other similar organisations and our members will happily lead you - with a light touch - around the mines of your choice. Leading does not mean following a set route, we'll give you some options and you can choose for yourself. There are some routes that are easy walking, others need SRT (either down only or down and back up), some need good caving kit (waste deep water and above - ooooh!). 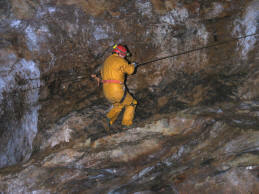 You will need to be an insured caver or become a Guest Member of the DCC for which an application form can be downloaded here. For a detailed map of the area, follow this link to the main Alderley mines page. 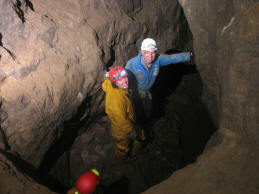 To arrange a visit, please contact the Club (alderleymines [at] Derbyscc.org.uk). We can let you change in the Surgery, our meeting room and store at Alderley Edge and we have plans and artefacts on display in the Museum behind the Wizard. As far as possible, the Club will try to accommodate more experienced visitors. However, the National Trust impose certain conditions regarding leaders who must be DCC members. If you are interested in a general tour or a visit to a specific part of the mines, please contact the Club well in advance. If you just want to join in with the Club's activities, feel free to turn up on a Tuesday night or a Sunday and take your chance. Contact the Club through the email above if you want to speak to some of the regular diggers to see what is likely to be going on when you visit. We usually meet at the Surgery, opposite the Wizard, or in the main car park.